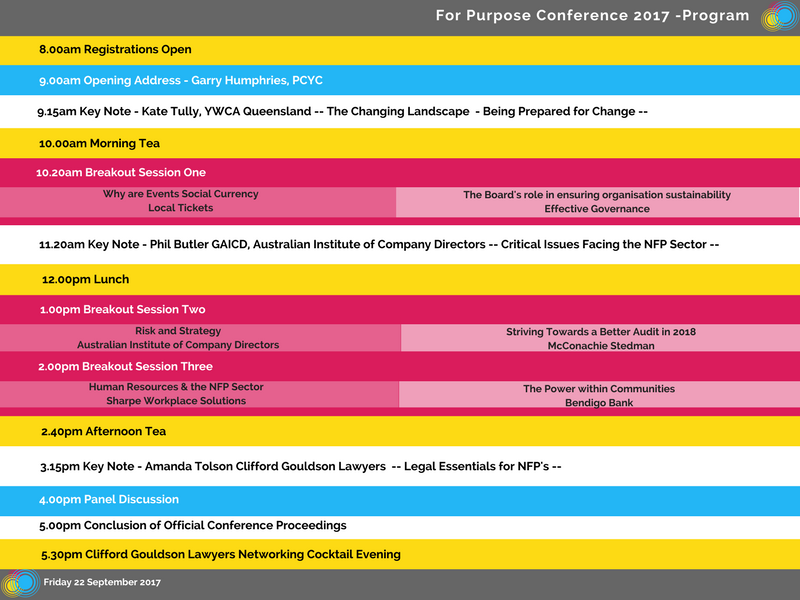 The USQ Student Guild is proud to be hosting the Inaugural ‘For Purpose Conference’ on 22 September 2017. The conference is specifically designed to allow you to collect and build the tools to promote long-term growth in your organisation and also help develop skills for sustainability in the sector. There are over 50,000 charities and even more Not-for-Profit (NFP) organisations across the country, with many being affected by changes in policies and the cuts to funding and government grants. Therefore, staying relevant, purpose driven, engaged and financially sustainable is on every NFP Organisations agenda and a key focus for Directors and Executive Teams alike. To help you and your organisation, we have brought together experts from a variety of fields that will provide you with practical and real-world solutions and knowledge. 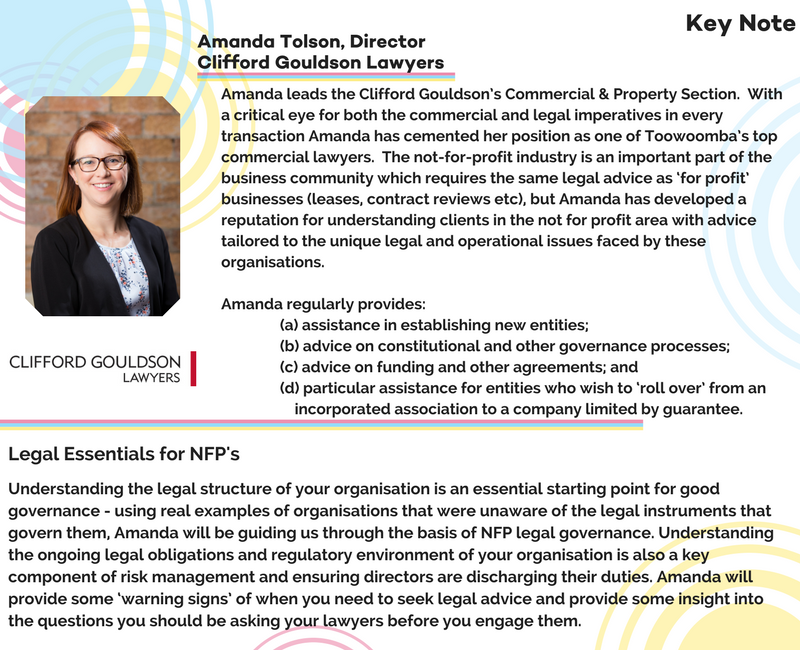 Register now for this not to be missed Conference; where you will have access to three amazing Keynote Speakers, three essential skill-building workshops and a fantastic evening of networking at our Clifford Gouldson Lawyers Cocktail Evening. 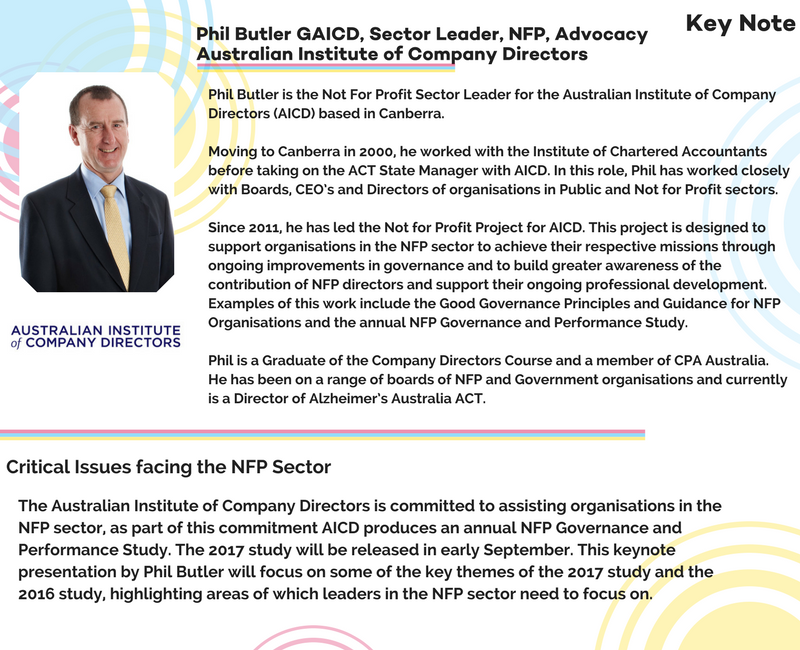 As Australia’s leading provider of governance education, the Australian Institute of Company Directors (AICD) is committed to excellence in governance. 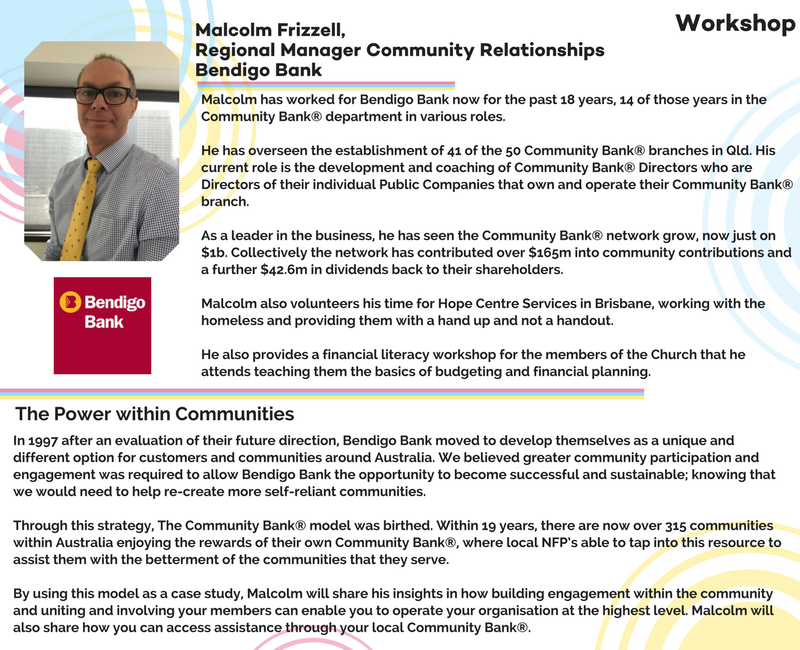 We are also passionate about assisting not-for-profit (NFP) organisations in improving their board effectiveness and the impact they have on their communities. Our research demonstrates that better governance enables superior organisational performance and outcomes. 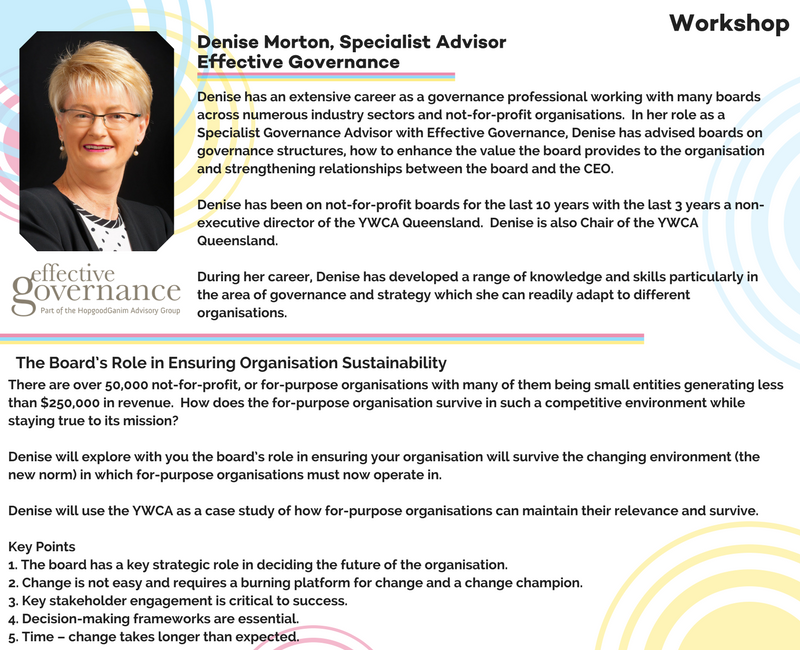 Therefore, we are delighted to support the ‘For Purpose’ Conference at the University of Southern Queensland Student Guild. I’d like to encourage all within the sector to join me at this event. 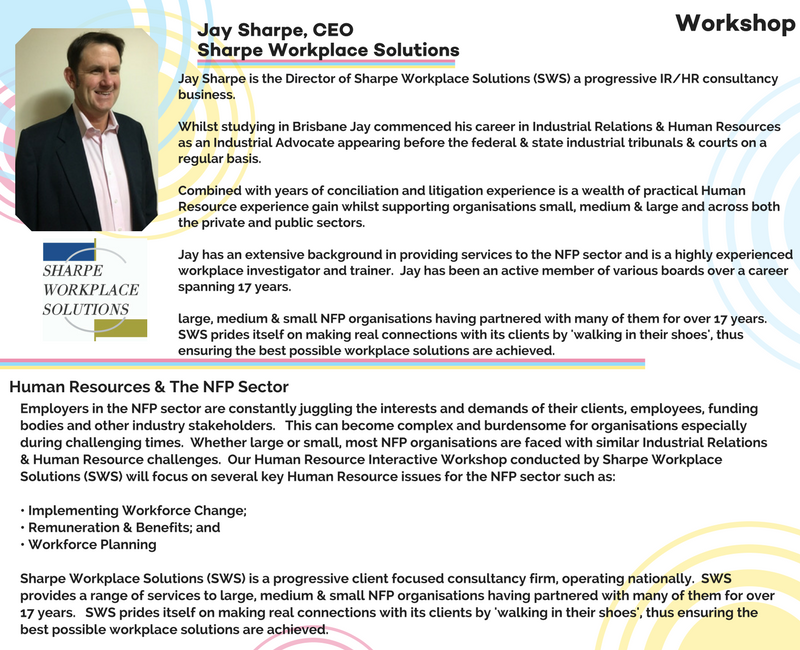 It will be a fantastic opportunity to hear from several sector experts on challenges currently facing NFP organisations, and to network and learn from your fellow delegates. Registration for the 2017 Conference is now open with Conference tickets available online. Please read through the information about the various options available to decide which ticket is most appropriate for you and your organisation. 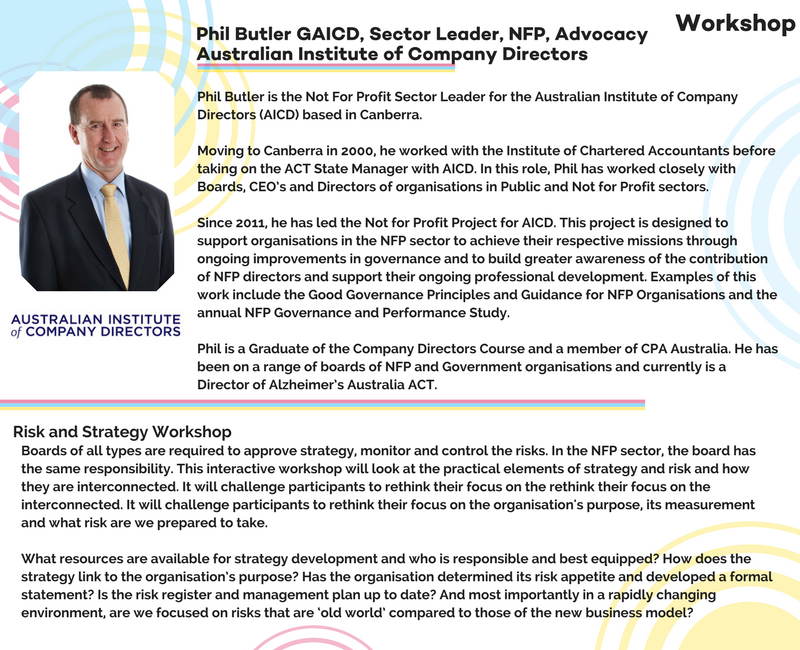 Are you an AICD member and would like access to the AICD members special price?Contact Sophie Hilber AAICD, Members and Directors Executive on shilber@aicd.com.au or 07 32225506 to receive the discount code. 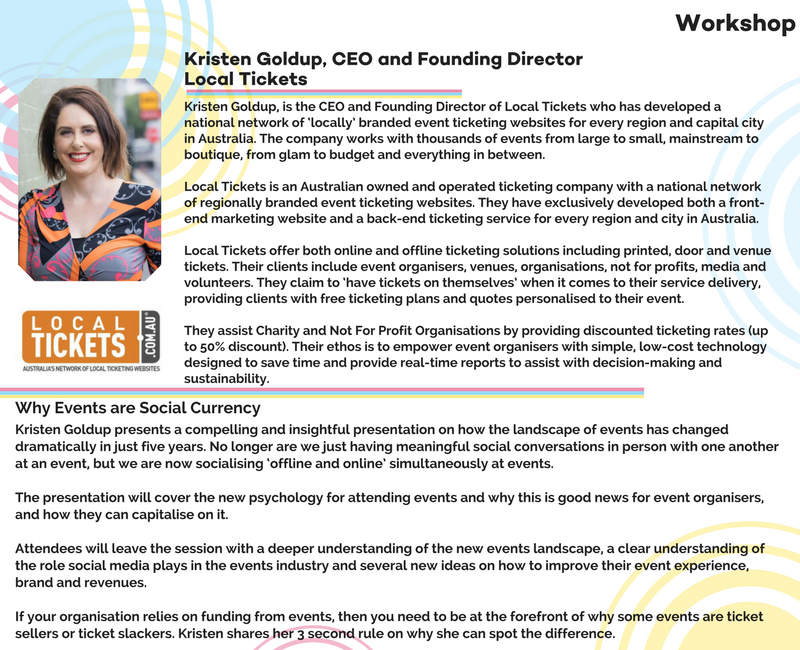 All tickets include attendance for the full program of the Conference, including access to all 3 Keynote Speakers and the discussion panel and attendance at 3 of the 6 workshops. Our tickets also include access to our post-conference Cocktail night. Organisation tickets also include at no extra charge inclusion in our For Purpose Conference Directory and a Standard stall within our Conversation Lounge. 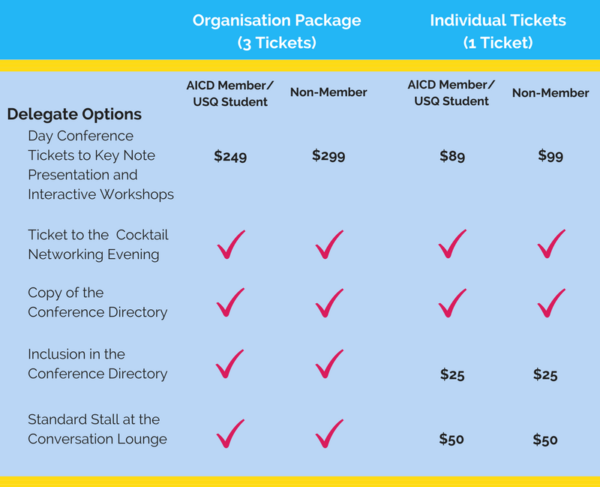 Individual tickets only include attendance at the Conference and the Cocktail night, however, inclusion in the Directory and Conversation Lounge can be purchased separately. 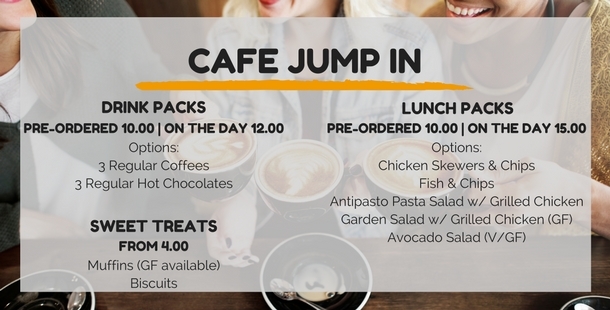 Please note that lunch is not catered for however you can pre-order your Lunch at a discounted rate through Jumpin Cafe when purchasing your tickets. Check out our Conference Specials for more information. Our Conference Directory is a great way to be able to communicate the services that you offer to over organisations and serves as a fantastic tool to remember contact details from the event. The directory will be a reliable tool for you and your organisation in the future when you are wanting to refer a client or find out more about how you can work with and obtain support from other organisations in the region. We will contact you closer to the Conference to organise your inclusion into the Directory. Would you like more information about a service or organisation but just haven’t had the time to follow up? Our Conversation Lounge provides you with that opportunity. Open throughout the entire event and containing information from a large variety of both service providers and other NFP organisations the Conversation Lounge will help you. 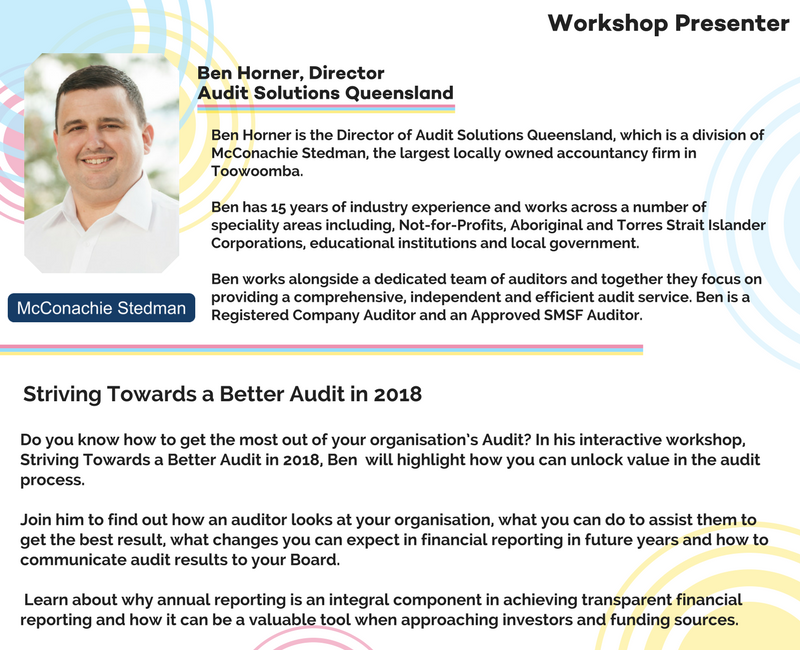 Registrations for our 3 Break Out Sessions are now available and we would encourage you to book your Workshop preferences as soon as possible as seats are limited for each workshop. Clive Berghofer Recreation Centre (Opposite USQ) Toowoomba. Located on Baker Street. 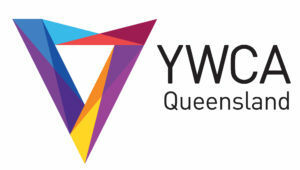 The USQ Residential Colleges have accommodation available for $88.00 per person per night which includes breakfast and Dinner. To find out more information about the accommodation options you can visit www.usq.edu.au/accommodation and select casual accommodation from the left-hand side. To book accommodation go to www.usq.edu.au/accommodation/casual-accommodation and apply for short-stay for students or others. By purchasing this ticket, the ticket holder/s have agreed to the full set of terms and conditions as outlined on the ticketing website. Ticket holders must present their tickets upon entry to the event as an A4 printed ticket (please do not resize the ticket) or on a Smart Phone. Government issued Photo ID and a valid ticket will be required upon entry to validate authenticity as a ticket holder. Refunds will be issued by Local Tickets Pty Ltd if this event is cancelled before the schedule start date and time for any reason including inclement weather, or reasons beyond the event hosts control such as severe weather, flood, fire, explosion, civil disobedience, riot, labour disturbances, failure or delay in transportation, war, sabotage or other acts of God. If the event is rescheduled, Local Tickets Pty Ltd reserves the right to decide whether Ticket Holders will automatically be refunded, or whether tickets will be transferred to another date with a refund option. Local Tickets Pty Ltd reserves the right to deduct administration and merchant fee charges on all refunds from Ticket Holders regardless of the reason for the refund. Ticket Holder details may be used by Local Tickets Pty Ltd and the Event Organiser for marketing purposes. Attendees must comply with all alcohol, smoking and behavioural laws within the event venue and or grounds. Attendees to the event must comply with the following dress standards, suitable shoes, or any other dress standard as required by law. The USQ Student Guild is committed to providing quality services to you and this policy outlines our ongoing obligations to you in respect of how we manage your Personal Information. 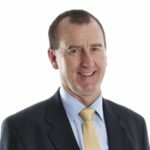 A copy of the Australian Privacy Principles may be obtained from the website of The Office of the Federal Privacy Commissioner at privacy.gov.au. This Personal Information is obtained in many ways including correspondence, by telephone and facsimile, by email, via our website www.studentguild.com.au, from your website, from media and publications, from other publicly available sources and from third parties. We don’t guarantee website links or policy of authorised third parties. USQ Student Guild will not charge any fee for your access request but may charge an administrative fee for providing a copy of your Personal Information. ‘Hirer’ means the business entity licensed to use the Centre to present the Event. The Hirer shall be responsible for the Event which it arranges. Any and all claims, complaints and damages arising out of or in connection with an Event, are to be directed to the Hirer. The Entrant is responsible for their personal belongings, the Centre takes no responsibility for the loss or damage of personal belongings. The Centre accepts no responsibility for any injury or death that results directly or indirectly from the use or misuse of the facilities by an Entrant or Hirer. All Entrants agree that upon entry that they shall follow government regulations and legislation and appropriate standards. Upon Entry, Entrants agree that they shall act respectfully towards other entrants and staff, including using appropriate language. An Entrant under the legal drinking age, shall not purchase and/or consume alcohol within the centre or the centre’s premises. An Entrant, of legal drinking age, agrees that they will not consume alcohol in excess of the legal driving limit of Queensland. Alcohol may only be consumed within the Centre where it is clearly indicated that consumption is permitted, otherwise, the consumption of alcohol within the centre is strictly prohibited. Entrants shall abide by all lawful and appropriate instructions and directions given by the Hirer or Owner and should an Entrant fail to abide by such directions or instructions, the hirer or owner may evict the entrant, without compensation. All entrants shall wear appropriate clothes and footwear at all times, the owner or Hirer reserves their right to evict any entrant who fails to comply. Smoking is prohibited in all areas of the Centre and within 10 meters of the Centre and its premises. The Owner reserves their right to evict any entrant smoking who fails to comply with this requirement. A Hirer and or its agents and/or the Owner or its agents may, at their absolute discretion conduct searches of Entrants for items which are prohibited by law or prohibited by the Hirer’s or Owners Terms of Admission. Unless expressly authorised by the Owner, the following items are strictly prohibited at the centre including firearms, explosives, flammable liquids, hazardous materials, controlled, dangerous or illegal substances, drugs, food or alcoholic beverages (whether for sale or supply) or any other goods or services for the purpose of sale or supply. Further, any smoke machines, misters, hazers, foggers, foamers, oil crackers, dry ice or fluid, dry density machines, pyrotechnics or similar atmospheric altering equipment, confetti, glitter, powder dust or other such substances, whether manually dispersed or by a discharge mechanism, without the specific prior written approval of the Owner. The Hirer and/or the Owner reserve the right to refuse admission and/or evict from the centre an entrant, without compensation, whose conduct is deemed to be unlawful, disorderly or offensive by the Hirer or Owner. This includes any person to is not entitled to attend the event. The Hirer or Owner may cancel, interrupt or stop an Event due to dangerous situations, adverse weather or any other reason which is beyond its reasonable control. Such cancellation, interruption and/or stopping of an Event shall not entitle the Entrant to make any claim whatsoever against the Owner. Nor shall it entitle the Entrant to make a claim whatsoever against the Hirer except, in the case of the Hirer, for and limited to a ticket for a replacement Event if scheduled or a refund of the appropriate portion of the face price of the ticket if the Event is cancelled and not subsequently rescheduled.